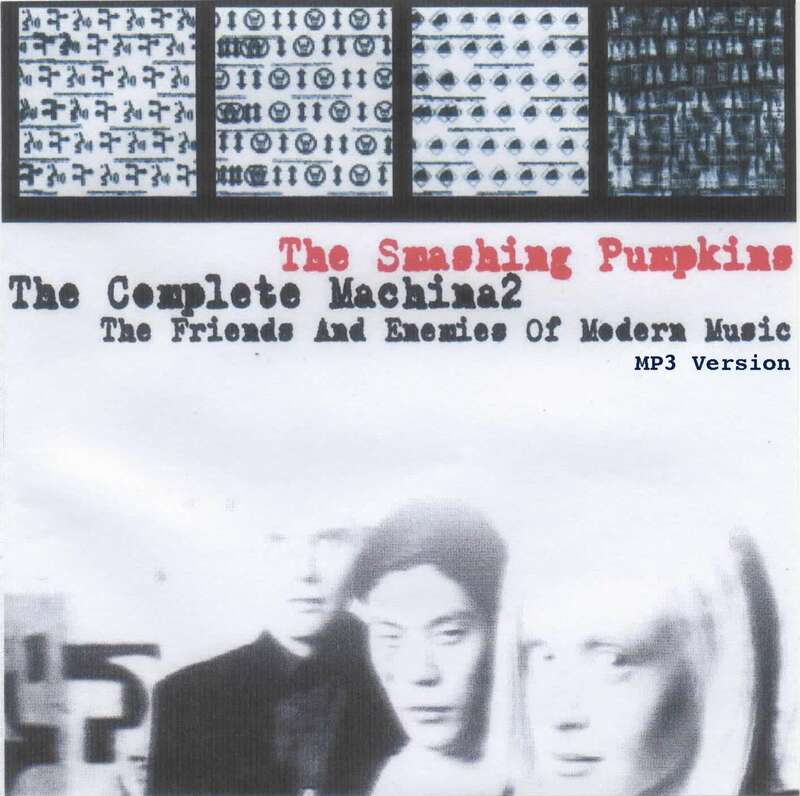 It's difficult to figure out why Billy Corgan decided to release Machina 2 in this mixed format of mini- and double-LPs. But surprisingly, when played back-to-back (on the CD), with less "change-breaks" between songs, Machina 2 is more coherent than one expects. The songs do flow and, more importantly, they do not sound like some quick throwaways - for instance, Let Me Give the World to You sounds like a good opener for any album. 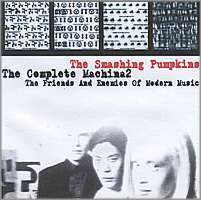 Machina 2, "released" in September 2000 and a follow-up to Machina, is often acknowledged by fans as the final album of The Smashing Pumpkins. A final farewell and a f*** you to a record label that didn't give them the support they deserved, a limited pressing album was made (3x10" and a double-LP, five discs total) and given away to fans to distribute. Altogether only 25 sets were made. Issued on Constantinople Records (Billy's own label), the 25 copies are on hand-cut, hand-numbered, non-lacquered acetate. The three 10"s come in plain white sleeves, the double-LP comes in a plain black sleeve with paper pasted to the inside, including "ch5/the story of june (so far)". 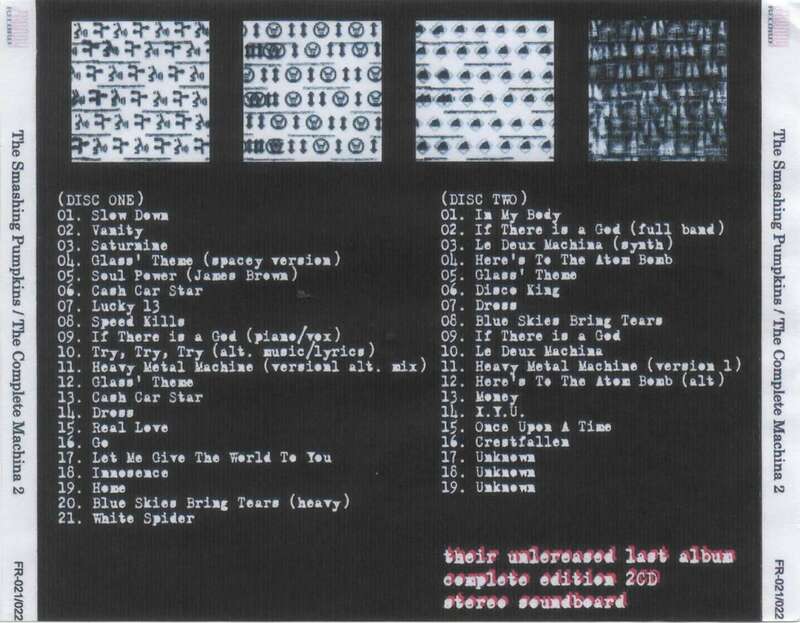 The discs are labelled with small stickers bearing CR 01 through CR 04 (CR 04 is the double-LP, with sides A-D). On September 5, 2000, 25 packages were sent out via FedEx. A CD release of this album was made by Q101, which was sourced from their vinyl copy. There are NO official CD releases, but a limited number of Virgin "in house" promos have been reported. Most of what is found on eBay is either a Q101 release, a burned CDR, or a bootleg sourced from the Q101 release or MP3s. The four-CD set of Virgin "in house" promos were sourced from the vinyl, and rejected for major label release. It has been reported that there were both US and UK versions of this promo, though there is currently more extensive proof regarding the authenticty of the UK promo. Click on the highlighted tracks to download the MP3s (these are high quality, stereo MP3s - sample rate of 192 kibit/s). As far as we can ascertain, with the exception of four tracks, the rest have never been officially released. These tracks are not for sale. Try, Try, Try (alt. music/lyrics) - "Try / Version 1"
Click here to visit AllofMP3.com to buy Smashing Pumpkins albums.